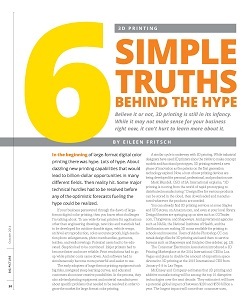 I was delighted to see that the ISA (International Sign Association) recently tweeted a link to the article on 3D printing I wrote for October issue of The Big Picture magazine. Having witnessed the emergence and evolution of large-format color graphics printing technology, I wrote about some striking similarities between the early days of wide-format and today’s explosion of interest in 3D printing. It wasn’t difficult to find sources who shared my view. Yet, 3D printing really isn’t about “printing.” It’s really more about how the technologies can be used to revolutionize fields such as manufacturing, healthcare, retailing, and construction. Perhaps one of the main similarities between “digital graphics printing” and “3D printing” is that 3D printing might soon enable on-demand, on-site printing of highly customized products. For example, you could get a pair of shoes custom printed at your retailer, or download the design from the store’s website and print the shoes on the 3D printer in your home. A lot of the hype about 3D printing seems geared toward expanding the maker community and encouraging more students and young designers to learn how to design structurally sound three-dimensional products (instead of flat, two-dimensional graphics). Plus, entrepreneurs and researchers want to be the first to discover the ultimate “killer app” for 3D printing. While 3D printing has long been used in rapid prototyping, efforts are underway to make it more practical to print all sorts of usable products including prosthetics, topographical maps, home accessories, building materials, movie and stage props (and costumes), fashion, and replacement parts. Because many signmakers are experienced in three-dimensional design of custom-made signs, it’s easy to see why 3D printing might appeal to signmakers. Will the HP 3D Printing Talk Prove to Be White Noise or Game-Changing? Finally, while researching my article I learned that today’s new breed of digital marketing agencies has begun experimenting with 3D printers, partly because part of their role is to help their clients understand how to benefit from new technologies. One of the funniest videos I’ve seen on the potential applications of 3D printing is entitled: “ReThink: the Agency with the Most Awards in the World.” Enjoy! One other source I recommend that you follow is the blog published by John Hauer, the CEO of 3DLT.com, a Cincinnati company that that envisions the future of 3D printing as a service. One of the great things about writing a story such as this one is that every source I interview inevitably suggests other interesting people I should talk to on the subject. If you have suggestions for follow-up coverage on this topic, please let me know!